Like everyone raised in the idyllic seaside town of The Burrow, the ocean played a large role in Rose Barros’ life. She lived her life to the rhythm of the tides until a near-death experience changed her love for the water to a soul-deep terror, driving a wedge between herself and her sister, Reen. Now, the only thing threatening to drown Rose is a mountain of bills and the burden of caring for her mother. She needs her sister more than ever, but rebellious Reen has skipped town and shows no interest in returning. But that all changes when two strangers arrive in the quiet seaside town and turn her life upside-down… The first, a girl who leaps from the pier before Rose’s eyes; the second, the handsome new Chief of Police who doesn’t take kindly to Rose interfering in his investigation of the girl’s disappearance. As they dig into the girl’s past, secrets are revealed, including a connection to Rose herself. Can Rose face her deepest fears, or will the truth lead her into deeper waters than she can handle? I have a confession to make – yes yet another one. 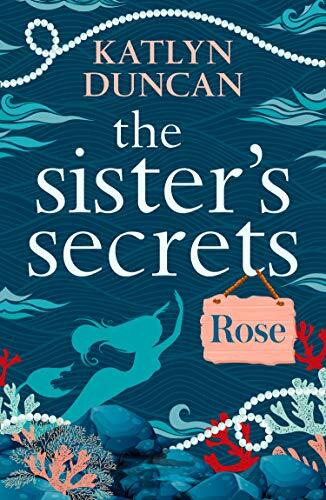 Prior to being invited to take part in the blog tour for ‘The Sisters’ Secrets: Rose’, I hadn’t actually come across Katlyn Duncan before. Well I have certainly come across her now. ‘The Sisters’ Secrets: Rose’ was certainly a different sort of read for me and I loved it but more about that in a bit. I did feel for Rose pretty much from the beginning of the book. She hasn’t particularly had an easy life. Her father has passed away, her mother is in a nursing home and her sister has left for pastures new and her whereabouts are apparently unknown. I did empathise with Rose over the distress she felt that her mother was in the grip of dementia and the heartache that follows when her mother doesn’t recognise her. Essentially Rose is on her own. She has a lot of responsibilities and often feels torn between her work life and her personal life. When she almost runs a girl over she gets out of the car to make sure that she is ok but the girl vanishes. She next sees the girl about to commit suicide. Rose tries to find out more about the mystery girl and about her background. The only problem is that obstacles are placed in her way. I couldn’t help but empathise with Rose and I was crossing my fingers that things worked out well for her in the end. I must admit that I really enjoyed this novella, which was a lot different to most of the books I usually read. This book has a bit of everything – there’s drama, there’s romance, there are light hearted moments and there is the hint of mystery with a sprinkling of lore and paranormal. The beginning of the book is certainly memorable and I won’t forget it in a hurry. It didn’t take me long to get into the book and reading it soon became an addiction. I was swept along by the story and I just had to keep reading to see what fate had in store for Rose. The pages turned over at quite a rate and I was disappointed when I got to the end of the book. I wasn’t disappointed with the ending, it was more a case of wanting the book to continue because I was enjoying it so much. In short, I really did love reading ‘The Sisters’ Secrets: Rose’ and I can’t wait for the next instalment to be released. Fortunately I don’t have too long to wait because the next instalment is due to be released on 10th January 2019. I would definitely recommend this author and this book to other readers, but particularly to those who like reading something a bit different. The score on the Ginger Book Geek board is a very well deserved 4* out of 5*.